Oftentimes when people return from traveling Xinjiang and the Silk Road, the very first thing they want to get their hands on is a Xinjiang recipes…a cookbook with authentic Uyghur recipes and Hui recipes. Unfortunately – at least as far as I can tell – this does not exist in English. Fortunately there are plenty of online resources that can help…if you’re willing to dig and find them! I’ve decided to take a few minutes here to share with you a few of my favorite Xinjiang foods as well as the recipes that will allow you to cook them at home. Each dish will have an internal link that will give you more details about the specific dish, as well as an external link to an authentic recipe for you to use. You can’t make Uyghur bread at home, right? Believe it or not, with the use of a good pizza stone or some clay quarry tiles, it is possible. 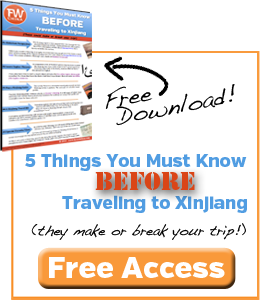 It might not be exactly the same as what you remember in Xinjiang, but it will be the next best thing. 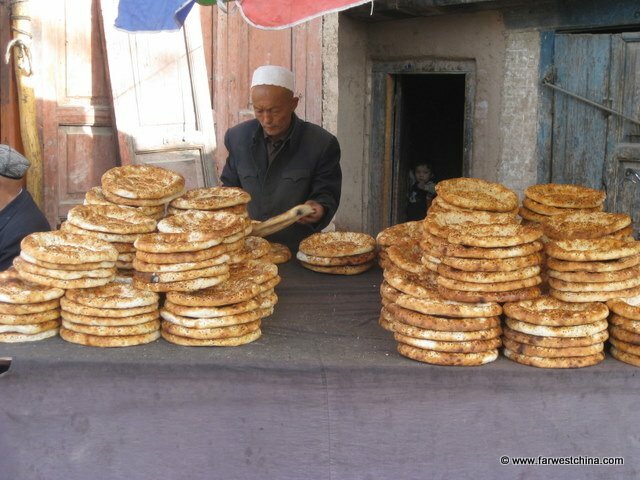 Check out this video to see how Uyghur bread is made in Xinjiang! 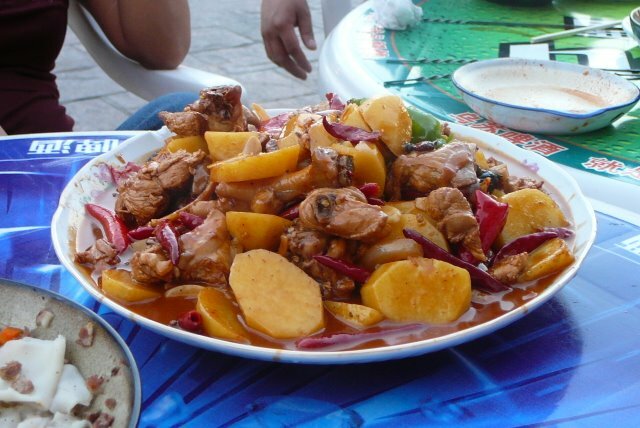 Big Plate Chicken is probably one of the most tried and failed recipes in all of Xinjiang. Most people just don’t realize that the secret behind what makes DaPanJi so special is the red sauce. The DaPanJi recipe I’m sharing here is a bit difficult because there are some unfamiliar ingredients (Hsao Xing Wine for example), but this can be overcome. If you don’t have access to a Chinese supermarket to get rice wine, a pale dry sherry will do the trick (apple juice will do if you don’t want to visit the liquor store). Also, the Xinjiang spice can be either a complex mix of spices, or you can just substitute cumin. Although I believe this dish is more “Central Asian” than “Xinjiang”, it is still a dish that most people absolutely love when they travel here to Xinjiang. There are quite a few different types of polo that the Uyghur people make, but the most common is what you see here (and what the recipe describes). Has this been helpful? Please use the sharebar on the left to share it with others. Thanks! I may have to try making naan at home when the weather cools off enough to use the oven. I’ve also found that Turkish pride bread makes a decent substitute. And fortunately, my wife makes dapanji…and has even taught me to make it (though I sometimes forget an ingredient or two). yum! these all sound SO delicious. thanks for the great resources! This is a great, great idea. I’ve tried to make Dapanji at home a few times but there’s always something missing, a certain flavor that’s lacking. Thanks for these recipes! My pleasure, Felix! Hopefully you’ll get to try and enjoy a couple of the other recipes as well. Thanks for sharing. I’ve noticed that there are different ways of making each dish depending on where you’re at in Xinjiang, so it’s nice to get multiple perspectives. I really disagree with the use of Mexican peppers in DaPanJi. It totally changes the flavor. You must use Asian red peppers. When in the US, I find then dried at the World Market. I also make it American style-boneless, skinless chicken breast so no one gets a surprise and breaks a tooth ;) Actually, I think it’s better and easier to eat but I never turn down the real thing-yum! I agree, although I think that some people would prefer to avoid the red peppers altogether, just like you would rather avoid the bones! If my wife is making it in the US for family/friends, we usually avoid bones as well, but if we want it to be authentic there’s just no substitute for chopping up an entire chicken…head, bones, feet, and all! Chengdu, and I imagine that its a little different in Xinjiang (though sounds exactly the same). I agree, use what you can find–just as different peppers will change the flavor, but removing skin and bones from chicken will also change the flavor of the dish (no fat or marrow reduces the richness), and the meat will dry out sooner. Btw, what is “Xinjiang spice” that’s mentioned in this recipe? There is at least one English-language cookbook out there! You should check out Lois Bachmann’s 2003 “Cooking for Uyghurs.” I think some of these recipes you’ve linked to might be better and more suited to an American kitchen, though. I have never seen it! I’ll definitely look that up…thanks for sharing. Really useful post. I’m on a huge kick at the moment to expand my (always interested, never mastered) cooking skills and I can’t wait to try some of these. We love love love Uyghur food and miss it so much. 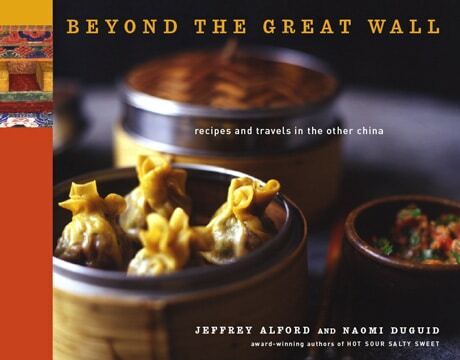 While it’s npt entirely recipies from Xingjoang, this cookbook does have some… “Behind the Great Wall”, by Naomi Duguid. Since moving back to Malaysia, we’ve been deprived of good uyghur cuisine. We used to frequent restaurants with names like Silk Road and Taklemakan right smack in Sydney CBD. Now I can at least try make that big plate chicken dish. Oh, I never knew the names of the dishes as the restaurants wrote them in Chinese with numbers next to it. My favourite was number 7, something like a kebab (the marinate) but fried instead of grilled. The lamb kebab is also heavenly, unlike the drier Turkish version. Now, where can I get hold of Xinjiang spices in Kuala Lumpur? purrr…meow! I’m doing a research on the herb called ‘Maca’. A Chinese man wrote this statement in Wikipedia, “Maca is widely consumed in Xinjiang, western China. We put it into lamb soup with potato & carrot. People think it is very good for health.” What I need is the Chinese name for Maca, in Chinese. I have a Chinese friend who is bad need to take this herb, but unless I can tell her the Chinese name for it, she would not know it. Please, help! Thank you. Hi there, does anyone know how to make plomash (not sure how to spell it)? Er? Wondering about your recipe for dapanji. 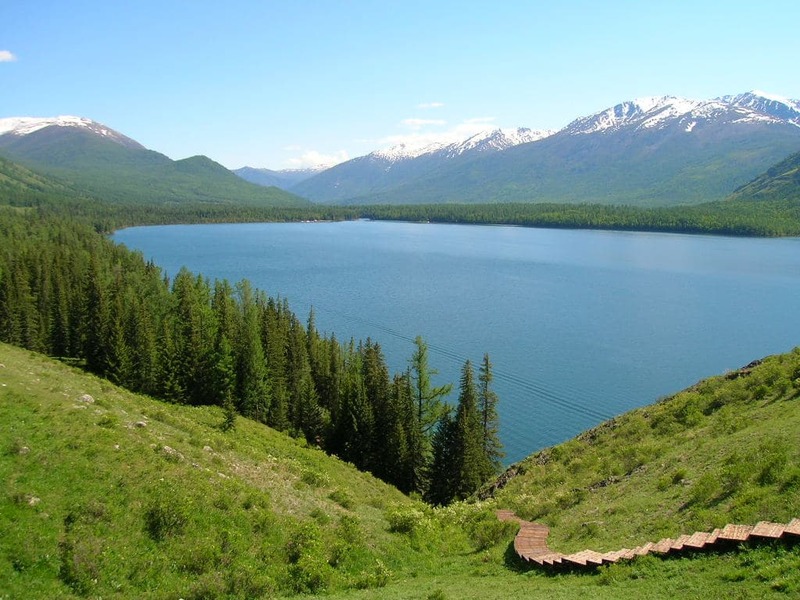 The people of Xinjiang are muslim. So how does their most famous dish contain xiaosheng wine from Meizhou City, Guangdong Province, China? Muslims technically don’t drink or use or handle alcohol. Is your recipe authentic and traditional or some ersatz popularized version? Dapanji was invented by a migrant worker from Sichuan who lived in Urumqi… so yeah I guess you can’t say it’s “authentic” but it’s so popular that it doesn’t really matter. His is only one version of how to make the dish… quite often, it doesn’t have any alcohol in it. You can look up substitutes. @Ari Whoever the migrant worker was. But he added alcohol in addition to the main ingredients :-) It can be cooked much better without using wine or alcohol. @Steve_H you are 100% right. I am Muslim from Pakistan and living in China for last 8 years. Dapanji (Big Plate Chicken) is a compulsory menu item in all Lanzhou Lamian (Halal certified muslim beef noodle shops spread all over china) and Xinjiang restaurants (Owned by Muslims or halal certified). The recipe of Dapanji here with the use of alcohol is certainly not authentic. The Sichuan pepper in the Xinjiang spice “complex mixture of spices” is ground, but what about the Sichuan pepper listed as an ingredient in the main recipe? Does that also refer to ground, or whole Sichuan peppercorns?